As it had promised to do last month, the prosecution announces that it will appeal the verdict and sentence of former PM Ehud Olmert. As it had promised to do last month, the prosecution announced on Tuesday that it plans to appeal the verdict and sentence in the case of former Prime Minister Ehud Olmert. The prosecution informed Olmert’s attorneys that it has not yet been decided which of the cases will be appealed. 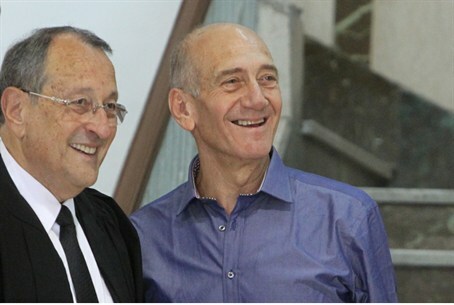 In July, the Jerusalem District Court found Olmert guilty on charges of breach of trust but acquitted him on more serious indictments of double-billing and receiving cash from American-Jewish businessman Moshe Talansky. In September, Olmert was given a relatively light sentence. He was slapped by the court with a fine of less than $18,000 and was given a one-year suspended jail sentence. The court did not accept the prosecutor’s request that Olmert serve six months in community service. The prosecution had not asked that Olmert’s crime be defined as one of “moral turpitude,” meaning he could return to politics, as has been speculated in recent weeks. Before his sentencing, Olmert attempted to escape a moral turpitude ruling by announcing he would give up the benefits he is entitled to as a former Prime Minister.